Florida Governor Jeb Bush declares a state of emergency In Southern Florida closing Schools and setting up Shelters in several counties in the southern part of the state. Voluntary and mandatory evacuation orders were issued for large areas of southeast Louisiana as well as coastal Mississippi and Alabama. 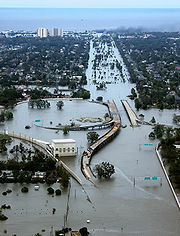 August 29th, 2005 Katrina Makes Landfall As Category 3 Louisiana. Section of the 17th Street Canal levee gives way allowing a sea of water from Lake Pontchartrain to flood Lakeview and into Mid-City, Carrollton, Gentilly, City Park and neighborhoods farther south and east. Louisiana governor Kathleen Blanco ordered the complete evacuation of Louisiana Superdome evacuees are transported to the Astrodome in Houston, Texas. Rescue Helicopters were also fired on by snipers attempting to keep control of large areas. Coast Guard rescues 1,200 people from rooftops In New Orleans. Gas Prices US Wide increase to record highs ( Reports of $5.00 per gallon in some areas ) due to disruption in oil supplies caused by Hurricane Katrina. 27,000 National Guard troops now stationed in Louisiana for disaster relief. 1,000 firefighters responding to calls for help from around the country undergo 1 days community relations training prior to beginning work in New Orleans. 1,000 firefighters responding to calls for help from around the country arrive In New Orleans To Provide Assistance. Floodwater in the city of New Orleans is found to hold dangerous levels of bacteria and lead which could cause serious problems for those coming in contact with floodwater. Due to the success of obtaining additional pumps U.S. Army Corps of Engineers estimates the City Of New Orleans will be dry before beginning of October. Public health officials use C-130 cargo planes to spray pesticide over New Orleans in an effort to control the mosquito population. President George W. Bush admits to the nation the government had failed to respond adequately to the devastation caused to New Orleans by Hurricane Katrina and urged Congress to approve a massive reconstruction program. Preparations are made for possible landfall of Tropical Storm Rita which could decimate the city due to weak structure of many levees. The Red Cross prepares to move 13,000 New Orleans evacuees from shelters in southern Louisiana that are vulnerable if Rita makes landfall in or near the state. July 2006 100,000 people still living in 37,745 FEMA-provided trailers.